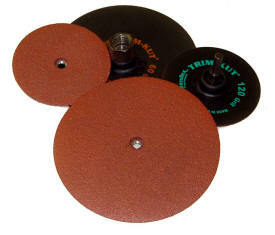 Trim-Kut discs feature aluminum oxide abrasive, and are ideal for light sanding and surface conditioning applications. The plastic back allows self-trimming to assure a constant fresh edge. The 3" diameter and 5" diameter discs come with a 1/4" straight shank that can be used in wide variety of tools from drills to collet tools. An adaptor is available (874002) to allow the 3" and 5' discs to be run on grinders with a 5/8-11 shaft. The 4-1/2" diameter discs have a 7/8" arbor hole, and are designed to use with a right angle grinder. It is recommended that they be used with the grinders wheel guard in place. Also do note exceed the listed maximum RPM for each disc. We now carry sanding discs with a polymer back in a quick change style. Click here for Mini GrindR Quick Change Discs.